We will only use your personal information to process your order and send you information you have requested. We do not pass on ANY personal details to ANYONE else for ANY reason whatsoever or do mailings or promotions on behalf of ANY other business..
You can browse our whole website without disclosing any personal data. 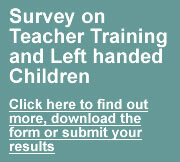 If you want to join the Left-Handers Club, we only need your name and email address. To place an order we will need your address and payment details. All screens and data transfers involving payment information are protected using SSL encryption. We have been registered with the UK Information Commissioner’s Office (formerly the Data Protection Registrar) since 2001, registration number Z597937X. This registration controls our collection, use, storage and security of all personal information recorded. When you place an order on our web site, we will send a confirmation email to the address you registered with. This will NOT contain your full payment details as email is not secure. If you have ticked the “opt-in” box asking for information from us on new products and offers, we will send occasional emails when we have things that we think may be of interest. If you have joined the free Left-Handers Club, we will send a welcome email and introductory newsletter, then further newsletters about one a month. spamwatch@anythingleft-handed.co.uk and we will investigate as best we can. A “cookie” is a small text file that a Website puts on your local hard drive so that it can remember something about you at a later time. Our online ordering system uses a cookie to record a unique reference on your computer so that we can keep track of your order and retain the contents of your shopping basket. To change your settings, search for “cookies” in your browser’s help screen.